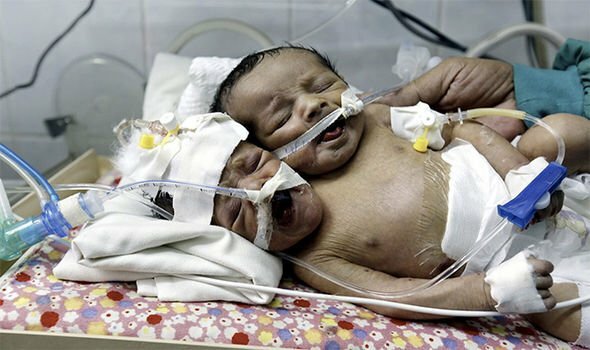 Twins Abdul-Khaliq and Abdul-Rahim were born in Al-Thawra hospital last night, sparking an ethical debate over their future which currently remains uncertain. The twins are joined at the neck and share a torso, but also have a condition called parapagus dicephalus, meaning they share a body but have their own heads, hearts, lungs, stomachs and backbones. The extremely rare condition has a low survival rate, with the situation being made all the more challenging as it not only requires treatment abroad to separate them, but the father has said he wants them to stay conjoined. Akram Ali Ahmed, 20, believes his newborn sons will have a better chance of survival if they stay joined, but doctor have warned that partial twinned babies such as Abdul-Khaliq and Abdul-Rahim rarely survive into adulthood. He said: “I want nothing to happen to my children. I don't want them to be separated and nor for one of them to die for the sake of the other. Adding further heartache to the parents, typically only one dicephalic parapagus twin has a tendency to survive. The twins currently lay in an incubator awaiting funding - and a decision to be made - on their fate. Doctors say medical capabilities in Yemen are very poor, especially in light of the ongoing war. Medics predict their health will naturally decline if they are not taken out of war-torn Yemen for treatment. Dr Faisal al-Balbi, head of the children's department at the hospital, said the twins condition is currently stable. He said: “Their health situation is fairly stable so far. They are sometimes given artificial respiration. “We are currently looking for funding and assistance so that we can provide appropriate healthcare for their very critical health status and move them out of Yemen. He added: “It is a unique case in Yemen - two children in one body with two heads, two hearts, two lungs, two stomachs and two backbones. They share only the pelvis and limbs of two hands and two legs.